’Twas a perfect afternoon with barely a breath of wind ruffling the lake surface 30 yards behind my hidey-hole in the shade of a stump alongside a low mesquite. It was a typical January in South Texas with hazy sunshine filtering through thin clouds and moist air to give everything a warm glow. Perfect for photography, and perfect for hunting predators. I’d been on the ranch a couple of days chasing coyotes and bobcats with renowned predator caller Johnny Stewart, a perfectionist when it came to calling wildlife and as interested in photography as I. We spent as much time setting up photos as we did hunting. After a good morning hunt, Johnny left with the ranch owner to go to town for a meeting, which left me to my own devices on thousands of acres of prime ranchland. It didn’t take long to find that ideal calling stand alongside what the ranch hands called Powerplant Lake, a narrow impoundment bordered by dense ratama, impenetrable whitebrush, and prickly pear—ideal habitat for predator and prey alike. I parked in a deep draw, hiked in a quarter-mile to the lakeshore, and then got set up to hunt. With water behind me, nothing would sneak in from the backside, and I surveyed a wide-open view of anything approaching along the creek bed that snaked below the dam. I started calling quietly and was barely into the second series when I caught a glimpse of movement along the lakeshore to my side. Whoa! An alligator, maybe the last thing I expected to see sneaking into my calling ambush, was laying quietly in the shallow water 30 yards away—and it looked huge. I commenced softly whimpering and squeaking through the Weem’s Wildcall, and the gator slid slowly out of the water and ambled toward me. Needless to say, my heart rate took off like a rocket. I hadn’t had many “up close and personal” encounters with alligators, and I estimated this gator easily topped 8 feet. At the time, alligators were on the endangered species list, so shooting was not an option. I watched the beast for another minute before glimpsing more movement just past the corner of the tank dam. Two coyotes came loping right at me. I forgot about alligator photos in favor of reducing the predator population, and when the second coyote hit the dirt, the gator was long gone. Later, the rancher told me they saw that big bull gator regularly, and it would pass the 9-foot mark with ease. By the mid 1900s, American alligator populations had plummeted due to massive habitat loss and unregulated market hunting. The amphibious predators were placed on the predecessor to the Federal Endangered Species list in 1967. With their niche of habitat conserved, prolific reproduction kicked in and they soon were thriving again in some areas, actually over populating others. Federal protection was lifted in 1987, and the gators have been expanding their range under state management ever since. Today, outfitters and guides across the South offer sport hunting for trophy-sized gators, and commercial hunters again harvest a sizable quota of alligator hides. One of the most common ways to take a gator is to hang a hefty chunk of chicken or other carcass meat on a big hook above a waterway where gators travel. Raising the bait high above the water excludes all but the largest and most valuable gators. I have been offered gator hunts along these lines, but dispatching a hooked gator is not my idea of a hunt. Alligator licenses range from less than $100 to more than $1,000 depending on the area hunted, and there are as many quirky laws governing alligator hunting as there are any other species. Several states prohibit shooting a gator unless it is attached to a line. Be sure to check closely wherever you plan a hunt. Some states allow night hunting where you cruise the sloughs and swamps searching for your gator. But my preference would definitely be to lure in a mature gator with a predator call. 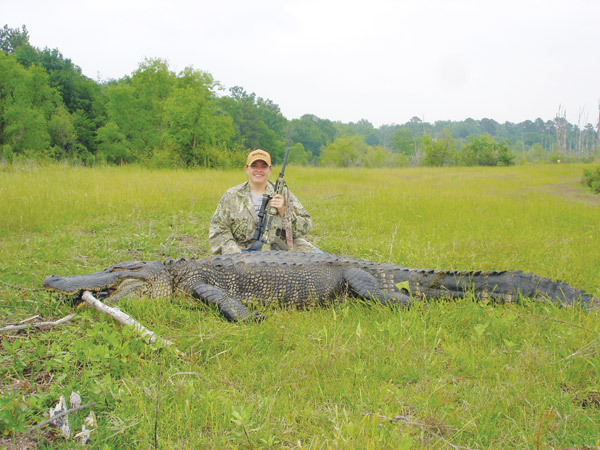 Byron South, of Big Sandy, Texas, is one of the most ardent predator hunters I know, and when I mentioned calling alligators a while back, he told me about his own alligator venture. Texas scheduled its first spring alligator hunt at a time when his work load allowed him to spend the time needed to call up a trophy gator for himself and his wife. Byron wasn’t sure which sounds were most likely to call gators, so he started perusing the internet to learn what he could. First thing he found out was that there wasn’t much out there about calling gators, which only intrigued Byron more. He figured the big lizards were just another predator and should be attracted to prey species sounds, such as rabbits, squealing birds and rodents. He was intrigued by the chirps newly hatched alligators make to call their mommas back to help them out of their shells, and also by the loud bellowing of bull alligators in the rut. He soon had both of these gator sounds downloaded onto his Foxpro electronic caller. Byron prefers electronic callers over mouth-blown because he feels he can better control the sound over the long haul, and he often stays on a stand all day, leaving the caller playing most of the time. That kind of calling effort would be mighty tough to maintain with lung power alone. Byron knew a ranch owner who said several big gators inhabited a 3-acre lake on his spread, a lake connected to a major river by impenetrable swamp. It was an ideal calling location but almost impossible to hunt by any other method. Repeated glassing around the lake with binoculars and a spotting scope confirmed the area held plenty of gators, including several trophies above 9 feet. But Byron soon realized how hard it can be to locate the truly big boys, as they are reclusive and lay unmoving for hours at a time, with only an eye showing at the waterline in scummy weeds and mud. Alligators use their motion-detecting vision to locate prey and also, apparently, to identify any potentially dangerous intrusions into their home waters. The slightest unwelcome movement, and the beasts simply sink out of sight without leaving any sign of their ever having been there. Byron said spot-and-stalk gator hunting and calling are on a par with pursuing a mature whitetail buck or bull elk. Given that a 9-foot bull (anything at the 9-foot mark is almost surely a male gator) may be 40 years old, a lot of experience and learned evasion tactics can be packed under that scaly skull plate. Same as all predator calling, time spent scouting is never wasted, and Byron and Lana’s extensive glassing was rewarded the first afternoon. They sneaked into shooting position along the edge of the pond where the rancher had seen the largest gator, a 12-foot behemoth, sunning on several occasions. Byron started playing bull bellows mixed with juvenile distress sounds, and within a minute or so, an 8-foot gator came drifting surreptitiously out of the rushes on the far side of the pond. Gators are hard to judge in the water, but a rule of thumb is that the distance between the eyes in inches is equal to the alligator’s length in feet. Eight inches between the eyes equates to an 8-foot alligator. This 8-footer was tempting, but Byron elected to wait for a bigger one, and, of course, Lana wasn’t about to settle for one he’d turned down. After another short stint of calling, Byron accidentally hit the preset switch on the caller and changed to loud coyote pup distress calls. Almost immediately, the 8-footer turned and started to get out of Dodge. Byron was thinking he’d blown the stand when a bigger gator drifted toward the caller from the opposite direction. As soon as his wife said she had the gator in the camera’s viewfinder, Byron fired a 90-grain slug from his .243 predator rifle. 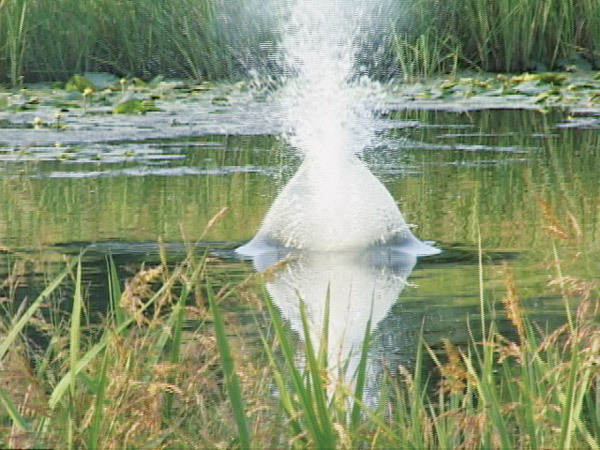 A gator in the water doesn’t present much of a target, and when the water geyser leveled out, this one had simply disappeared—no roil, no boil, no ripples, nothing. Byron spent every available minute the next week trying to dredge up the gator without seeing it alive or dead. It just wasn’t there. The following Friday, he sneaked into the edge of the same pond and placed the electronic caller on the side opposite the stand, hoping that getting a gator between him and the caller would give him a better broadside or quartering away shot. Only brain shots anchor a gator on the spot. After several hours, a big gator appeared on the surface eyeing the location of the squeaking and squealing caller. This time Byron waited until he had a perfect rear skull shot with a super accurate .223 AR-15. The gator simply rolled belly up, and the hunt was over. It wasn’t the 12-footer but still measured 9 feet. A few days later, he and Lana spotted the big gator, and after an arduous stalk to within 100 yards, Lana made a clean one-shot kill on a bull that measured 11-1/2 feet. They needed the winch on the pickup truck to haul it out of the pond. Don Hampton outfits trophy alligator hunts in Florida and offers calling as a hunting method. According to Don, the best time of year to sucker a big gator with a call is July and August, when the Florida heat is almost unbearable but the lizards are constantly on the move looking for something to eat. Don said he feels any distress call might work for alligators, but he prefers the recorded sounds of newly hatched baby alligators. The high-pitched chirps are equally attractive to maternal females and cannibalistic males. Earlier in the spring, during the peak of the rut, bulls bellow to establish their territory, to attract females and intimidate other males. Don said such sounds are liable to pique the curiosity of any belligerent bull gator. The last time an alligator responded to my calls, I was hunting turkeys in Florida. I got so caught up in trying to photograph the gator I blew a chance at a nice Osceola gobbler—and could not have cared less. A return engagement is at the top of my list, only this time I will have a gator tag in my pocket.